Tyrosine hydroxylase or tyrosine 3-monooxygenase is the enzyme responsible for catalyzing the conversion of the amino acid L-tyrosine to L-3,4-dihydroxyphenylalanine (L-DOPA). It does so using molecular oxygen (O2), as well as iron (Fe2+) and tetrahydrobiopterin as cofactors. L-DOPA is a precursor for dopamine, which, in turn, is a precursor for the important neurotransmitters norepinephrine (noradrenaline) and epinephrine (adrenaline). Tyrosine hydroxylase catalyzes the rate limiting step in this synthesis of catecholamines. In humans, tyrosine hydroxylase is encoded by the TH gene, and the enzyme is present in the central nervous system (CNS), peripheral sympathetic neurons and the adrenal medulla. Tyrosine hydroxylase, phenylalanine hydroxylase and tryptophan hydroxylase together make up the family of aromatic amino acid hydroxylases (AAAHs). Tyrosine hydroxylase catalyzes the reaction in which L-tyrosine is hydroxylated in the meta position to obtain L-3,4-dihydroxyphenylalanine (L-DOPA). The enzyme is an oxygenase which means it uses molecular oxygen to hydroxylate its substrates. One of the oxygen atoms in O2 is used to hydroxylate the tyrosine molecule to obtain L-DOPA and the other one is used to hydroxylate the cofactor. Like the other aromatic amino acid hydroxylases (AAAHs), tyrosine hydroxylase use the cofactor tetrahydrobiopterin (BH4) under normal conditions, although other similar molecules may also work as a cofactor for tyrosine hydroxylase. The AAAHs converts the cofactor 5,6,7,8-tetrahydrobiopterin (BH4) into tetrahydrobiopterin-4a-carbinolamine (4a-BH4). Under physiological conditions, 4a-BH4 is dehydrated to quinonoid-dihydrobiopterin (q-BH2) by the enzyme pterin-4a-carbinolamine dehydrase (PCD) and a water molecule is released in this reaction. Then, the NAD(P)H dependent enzyme dihydropteridine reductase (DHPR) converts q-BH2 back to BH4. Each of the four subunits in tyrosine hydroxylase is coordinated with an iron(II) atom presented in the active site. The oxidation state of this iron atom is important for the catalytic turnover in the enzymatic reaction. If the iron is oxidized to Fe(III), the enzyme is inactivated. The product of the enzymatic reaction, L-DOPA, can be transformed to dopamine by the enzyme DOPA decarboxylase. Dopamine may be converted into norepinephrine by the enzyme dopamine β-hydroxylase, which can be further modified by the enzyme phenylethanol N-methyltransferase to obtain epinephrine. Since L-DOPA is the precursor for the neurotransmitters dopamine, noradrenaline and adrenaline, tyrosine hydroxylase is therefore found in the cytosol of all cells containing these catecholamines. This initial reaction catalyzed by tyrosine hydroxylase has been shown to be the rate limiting step in the production of catecholamines. The enzyme is highly specific, not accepting indole derivatives - which is unusual as many other enzymes involved in the production of catecholamines do. Tryptophan is a poor substrate for tyrosine hydroxylase, however it can hydroxylate L-phenylalanine to form L-tyrosine and small amounts of 3-hydroxyphenylalanine. The enzyme can then further catalyze L-tyrosine to form L-DOPA. Tyrosine hydroxylase may also be involved in other reactions as well, such as oxidizing L-DOPA to form 5-S-cysteinyl-DOPA or other L-DOPA derivatives. 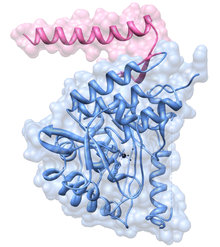 Tyrosine hydroxylase from rat showing two of its domains, the tetramerization domain (pink) and the catalytic domain (blue). The regulatory domain (not shown) would sit somewhere on the right hand side of the image where also the enzyme's substrate would enter from. 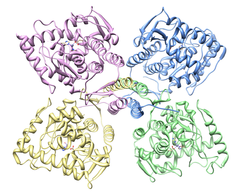 Tyrosine hydroxylase is a tetramer of four identical subunits (homotetramer). Each subunit consists of three domains. At the carboxyl terminal of the peptide chain there's a short alpha helix domain that allows tetramerization. The central ~300 amino acids make up a catalytic core, in which all the residues necessary for catalysis are located, along with a non-covalently bound iron atom. The iron is held in place by two histidine residues and one glutamate residue, making it a non-heme, non-iron-sulfur iron-containing enzyme. The amino terminal ~150 amino acids make up a regulatory domain, thought to control access of substrates to the active site. In humans there are thought to be four different versions of this regulatory domain, and thus four versions of the enzyme, depending on alternative splicing, though none of their structures have yet been properly determined. It has been suggested that this domain might be an intrinsically unstructured protein, which has no clearly defined tertiary structure, but so far no evidence has been presented supporting this claim. It has however been shown that the domain has a low occurrence of secondary structures, which doesn't weaken suspicions of it having a disordered overall structure. As for the tetramerization and catalytic domains their structure was found with rat tyrosine hydroxylase using X-ray crystallography. This has shown how its structure is very similar to that of phenylalanine hydroxylase and tryptophan hydroxylase; together the three make up a family of homologous aromatic amino acid hydroxylases. Tyrosine hydroxylase activity is increased in the short term by phosphorylation. The regulatory domain of tyrosine hydroxylase contains multiple serine (Ser) residues, including Ser8, Ser19, Ser31 and Ser40, that are phosphorylated by a variety of protein kinases. Ser40 is phosphorylated by the cAMP-dependent protein kinase. Ser19 (and Ser40 to a lesser extent) is phosphorylated by the calcium-calmodulin-dependent protein kinase. MAPKAPK2 (mitogen-activated-protein kinase-activating protein kinase) has a preference for Ser40, but also phosphorylates Ser19 about half the rate of Ser40. Ser31 is phosphorylated by ERK1 and ERK2 (extracellular regulated kinases 1&2), and increases the enzyme activity to a lesser extent than for Ser40 phosphorylation. The phosphorylation at Ser19 and Ser8 has no direct effect on tyrosine hydroxylase activity. But phosphorylation at Ser19 increases the rate of phosphorylation at Ser40, leading to an increase in enzyme activity. Phosphorylation at Ser19 causes a two-fold increase of activity, through a mechanism that requires the 14-3-3 proteins. Phosphorylation at Ser31 causes a slight increase of activity, and here the mechanism is unknown. Tyrosine hydroxylase is somewhat stabilized to heat inactivation when the regulatory serines are phosphorylated. Tyrosine hydroxylase is mainly present in the cytosol, although it also is found in some extent in the plasma membrane. The membrane association may be related to catecholamine packing in vesicles and export through the synaptic membrane. The binding of tyrosine hydroxylase to membranes involves the N-terminal region of the enzyme, and may be regulated by a three-way interaction between 14-3-3 proteins, the N-terminal region of tyrosine hydroxylase, and negatively charged membranes. Tyrosine hydroxylase can also be regulated by inhibition. Phosphorylation at Ser40 relieves feedback inhibition by the catecholamines dopamine, epinephrine, and norepinephrine. The catecholamines trap the active-site iron in the Fe(III) state, inhibiting the enzyme. It has been shown that the expression of tyrosine hydroxylase can be affected by the expression of SRY. The down regulation of the SRY gene in the substantia nigra can result in a decrease in tyrosine hydroxylase expression. Long term regulation of tyrosine hydroxylase can also be mediated by phosphorylation mechanisms. Hormones (e.g. glucocorticoids), drugs (e.g. cocaine), or second messengers such as cAMP increase tyrosine hydroxylase transcription. Increase in tyrosine hydroxylase activity due to phosphorylation can be sustained by nicotine for up to 48 hours. Tyrosine hydroxylase activity is regulated chronically (days) by protein synthesis. A deficiency of tyrosine hydroxylase leads to impaired synthesis of dopamine as well as epinephrine and norepinephrine. It is represented by a progressive encephalopathy and poor prognosis. Clinical features include dystonia that is minimally or nonresponsive to levodopa, extrapyramidal symptoms, ptosis, miosis, and postural hypotension. This is a progressive and often lethal disorder, which can be improved but not cured by levodopa. Response to treatment is variable and the long-term and functional outcome is unknown. To provide a basis for improving the understanding of the epidemiology, genotype/phenotype correlation and outcome of these diseases their impact on the quality of life of patients, and for evaluating diagnostic and therapeutic strategies a patient registry was established by the noncommercial International Working Group on Neurotransmitter Related Disorders (iNTD). Additionally alterations in the tyrosine hydroxylase enzyme activity may be involved in disorders such as Segawa's dystonia, Parkinson's disease and schizophrenia. Tyrosine hydroxylase is activated by phosphorylation dependent binding to 14-3-3 proteins. Since the 14-3-3 proteins also are likely to be associated with neurodegenerative diseases such as Alzheimer's disease, Parkinson's disease and Huntington's disease, it makes an indirect link between tyrosine hydroxylase and these diseases. The activity of tyrosine hydroxylase in the brains of patients with Alzheimer’s disease has been shown to be significantly reduced compared to healthy individuals. Tyrosine hydroxylase is also an autoantigen in Autoimmune Polyendocrine Syndrome (APS) type I. A consistent abnormality in Parkinson's disease is degeneration of dopaminergic neurons in the substantia nigra, leading to a reduction of striatal dopamine levels. As tyrosine hydroxylase catalyzes the formation of L-DOPA, the rate-limiting step in the biosynthesis of dopamine, tyrosine hydroxylase-deficiency does not cause Parkinson's disease, but typically gives rise to infantile parkinsonism, although the spectrum extends to a condition resembling dopamine-responsive dystonia. A direct pathogenetic role of tyrosine hydroxylase has also been suggested, as the enzyme is a source of H2O2 and other reactive oxygen species (ROS), and a target for radical-mediated injury. It has been demonstrated that L-DOPA is effectively oxidized by mammalian tyrosine hydroxylase, possibly contributing to the cytotoxic effects of L-DOPA. Like other cellular proteins, tyrosine hydroxylase is also a possible target for damaging alterations induced by ROS. This suggests that some of the oxidative damage to tyrosine hydroxylase could be generated by the tyrosine hydroxylase system itself. Tyrosine hydroxylase can be inhibited by the drug α-methyl-para-tyrosine (metirosine). This inhibition can lead to a depletion of dopamine and norepinepherine in the brain due to the lack of the precursor L-Dopa (L-3,4-dyhydroxyphenylalanine) which is synthesized by tyrosine hydroxylase. This drug is rarely used and can cause depression, but it is useful in treating pheochromocytoma and also resistant hypertension. Older examples of inhibitors mentioned in the literature include oudenone and aquayamycin. ^ Kaufman S (1995). "Tyrosine hydroxylase". Advances in Enzymology and Related Areas of Molecular Biology. Advances in Enzymology - and Related Areas of Molecular Biology. 70: 103–220. doi:10.1002/9780470123164.ch3. ISBN 978-0-470-12316-4. PMID 8638482. ^ a b c Nagatsu T (1995). "Tyrosine hydroxylase: human isoforms, structure and regulation in physiology and pathology". Essays in Biochemistry. 30: 15–35. PMID 8822146. ^ a b c d e f g Haavik J, Toska K (Jun 1998). "Tyrosine hydroxylase and Parkinson's disease". Molecular Neurobiology. 16 (3): 285–309. doi:10.1007/BF02741387. PMID 9626667. ^ a b Teigen K, McKinney JA, Haavik J, Martínez A (2007). "Selectivity and affinity determinants for ligand binding to the aromatic amino acid hydroxylases". Current Medicinal Chemistry. 14 (4): 455–67. doi:10.2174/092986707779941023. PMID 17305546. ^ Thöny B, Auerbach G, Blau N (Apr 2000). "Tetrahydrobiopterin biosynthesis, regeneration and functions". The Biochemical Journal. 347 Pt 1 (1): 1–16. doi:10.1042/0264-6021:3470001. PMC 1220924. PMID 10727395. ^ Ramsey AJ, Hillas PJ, Fitzpatrick PF (Oct 1996). "Characterization of the active site iron in tyrosine hydroxylase. Redox states of the iron". The Journal of Biological Chemistry. 271 (40): 24395–400. doi:10.1074/jbc.271.40.24395. PMID 8798695. ^ a b Nagatsu T, Levitt M, Udenfriend S (Sep 1964). "Tyrosine Hydroxylase. The Initial Step in Norepinephrine Biosynthesis". The Journal of Biological Chemistry. 239: 2910–7. PMID 14216443. ^ a b c Fitzpatrick PF (1999). "Tetrahydropterin-dependent amino acid hydroxylases". Annual Review of Biochemistry. 68: 355–81. doi:10.1146/annurev.biochem.68.1.355. PMID 10872454. ^ Fitzpatrick PF (1994). "Kinetic Isotope Effects on Hydroxylation of Ring-Deuterated Phenylalanines by Tyrosine Hydroxylase Provide Evidence against Partitioning of an Arene Oxide Intermediate". Journal of the American Chemical Society. 116 (3): 1133–1134. doi:10.1021/ja00082a046. ^ Haavik J, Flatmark T (Oct 1987). "Isolation and characterization of tetrahydropterin oxidation products generated in the tyrosine 3-monooxygenase (tyrosine hydroxylase) reaction". European Journal of Biochemistry / FEBS. 168 (1): 21–6. doi:10.1111/j.1432-1033.1987.tb13381.x. PMID 2889594. ^ Vrana KE, Walker SJ, Rucker P, Liu X (Dec 1994). "A carboxyl terminal leucine zipper is required for tyrosine hydroxylase tetramer formation". Journal of Neurochemistry. 63 (6): 2014–20. doi:10.1046/j.1471-4159.1994.63062014.x. PMID 7964718. ^ Ramsey AJ, Daubner SC, Ehrlich JI, Fitzpatrick PF (Oct 1995). "Identification of iron ligands in tyrosine hydroxylase by mutagenesis of conserved histidinyl residues". Protein Science. 4 (10): 2082–6. doi:10.1002/pro.5560041013. PMC 2142982. PMID 8535244. ^ Daubner SC, Le T, Wang S (Apr 2011). "Tyrosine hydroxylase and regulation of dopamine synthesis". Archives of Biochemistry and Biophysics. 508 (1): 1–12. doi:10.1016/j.abb.2010.12.017. PMC 3065393. PMID 21176768. ^ Kobayashi K, Kaneda N, Ichinose H, Kishi F, Nakazawa A, Kurosawa Y, Fujita K, Nagatsu T (Jun 1988). "Structure of the human tyrosine hydroxylase gene: alternative splicing from a single gene accounts for generation of four mRNA types". Journal of Biochemistry. 103 (6): 907–12. PMID 2902075. ^ a b Nakashima A, Hayashi N, Kaneko YS, Mori K, Sabban EL, Nagatsu T, Ota A (Nov 2009). "Role of N-terminus of tyrosine hydroxylase in the biosynthesis of catecholamines". Journal of Neural Transmission. 116 (11): 1355–62. doi:10.1007/s00702-009-0227-8. PMID 19396395. ^ Obsilova V, Nedbalkova E, Silhan J, Boura E, Herman P, Vecer J, Sulc M, Teisinger J, Dyda F, Obsil T (Feb 2008). "The 14-3-3 protein affects the conformation of the regulatory domain of human tyrosine hydroxylase". Biochemistry. 47 (6): 1768–77. doi:10.1021/bi7019468. PMID 18181650. ^ a b Goodwill KE, Sabatier C, Marks C, Raag R, Fitzpatrick PF, Stevens RC (Jul 1997). "Crystal structure of tyrosine hydroxylase at 2.3 A and its implications for inherited neurodegenerative diseases". Nature Structural Biology. 4 (7): 578–85. doi:10.1038/nsb0797-578. PMID 9228951. ^ Goodwill KE, Sabatier C, Stevens RC (Sep 1998). "Crystal structure of tyrosine hydroxylase with bound cofactor analogue and iron at 2.3 A resolution: self-hydroxylation of Phe300 and the pterin-binding site". Biochemistry. 37 (39): 13437–45. doi:10.1021/bi981462g. PMID 9753429. ^ Ledley FD, DiLella AG, Kwok SC, Woo SL (Jul 1985). "Homology between phenylalanine and tyrosine hydroxylases reveals common structural and functional domains". Biochemistry. 24 (14): 3389–94. doi:10.1021/bi00335a001. PMID 2412578. ^ Grenett HE, Ledley FD, Reed LL, Woo SL (Aug 1987). "Full-length cDNA for rabbit tryptophan hydroxylase: functional domains and evolution of aromatic amino acid hydroxylases". Proceedings of the National Academy of Sciences of the United States of America. 84 (16): 5530–4. doi:10.1073/pnas.84.16.5530. PMC 298896. PMID 3475690. ^ Haycock JW (Jul 1990). "Phosphorylation of tyrosine hydroxylase in situ at serine 8, 19, 31, and 40". The Journal of Biological Chemistry. 265 (20): 11682–91. PMID 1973163. ^ Roskoski R, Roskoski LM (Jan 1987). "Activation of tyrosine hydroxylase in PC12 cells by the cyclic GMP and cyclic AMP second messenger systems". Journal of Neurochemistry. 48 (1): 236–42. doi:10.1111/j.1471-4159.1987.tb13153.x. PMID 2878973. ^ Lehmann IT, Bobrovskaya L, Gordon SL, Dunkley PR, Dickson PW (Jun 2006). "Differential regulation of the human tyrosine hydroxylase isoforms via hierarchical phosphorylation". The Journal of Biological Chemistry. 281 (26): 17644–51. doi:10.1074/jbc.M512194200. PMID 16644734. ^ a b c Dunkley PR, Bobrovskaya L, Graham ME, von Nagy-Felsobuki EI, Dickson PW (Dec 2004). "Tyrosine hydroxylase phosphorylation: regulation and consequences". Journal of Neurochemistry. 91 (5): 1025–43. doi:10.1111/j.1471-4159.2004.02797.x. PMID 15569247. ^ Sutherland C, Alterio J, Campbell DG, Le Bourdellès B, Mallet J, Haavik J, Cohen P (Oct 1993). "Phosphorylation and activation of human tyrosine hydroxylase in vitro by mitogen-activated protein (MAP) kinase and MAP-kinase-activated kinases 1 and 2". European Journal of Biochemistry / FEBS. 217 (2): 715–22. doi:10.1111/j.1432-1033.1993.tb18297.x. PMID 7901013. ^ Haycock JW, Ahn NG, Cobb MH, Krebs EG (Mar 1992). "ERK1 and ERK2, two microtubule-associated protein 2 kinases, mediate the phosphorylation of tyrosine hydroxylase at serine-31 in situ". Proceedings of the National Academy of Sciences of the United States of America. 89 (6): 2365–9. doi:10.1073/pnas.89.6.2365. PMC 48658. PMID 1347949. ^ Ichimura T, Isobe T, Okuyama T, Takahashi N, Araki K, Kuwano R, Takahashi Y (Oct 1988). "Molecular cloning of cDNA coding for brain-specific 14-3-3 protein, a protein kinase-dependent activator of tyrosine and tryptophan hydroxylases". Proceedings of the National Academy of Sciences of the United States of America. 85 (19): 7084–8. doi:10.1073/pnas.85.19.7084. PMC 282128. PMID 2902623. ^ Royo M, Fitzpatrick PF, Daubner SC (Feb 2005). "Mutation of regulatory serines of rat tyrosine hydroxylase to glutamate: effects on enzyme stability and activity". Archives of Biochemistry and Biophysics. 434 (2): 266–74. doi:10.1016/j.abb.2004.11.007. PMID 15639226. ^ a b Chen R, Wei J, Fowler SC, Wu JY (2003). "Demonstration of functional coupling between dopamine synthesis and its packaging into synaptic vesicles". Journal of Biomedical Science. 10 (6 Pt 2): 774–81. doi:10.1159/000073965. PMID 14631117. ^ a b Halskau Ø, Ying M, Baumann A, Kleppe R, Rodriguez-Larrea D, Almås B, Haavik J, Martinez A (Nov 2009). "Three-way interaction between 14-3-3 proteins, the N-terminal region of tyrosine hydroxylase, and negatively charged membranes". The Journal of Biological Chemistry. 284 (47): 32758–69. doi:10.1074/jbc.M109.027706. PMC 2781693. PMID 19801645. ^ Daubner SC, Lauriano C, Haycock JW, Fitzpatrick PF (Jun 1992). "Site-directed mutagenesis of serine 40 of rat tyrosine hydroxylase. Effects of dopamine and cAMP-dependent phosphorylation on enzyme activity". The Journal of Biological Chemistry. 267 (18): 12639–46. PMID 1352289. ^ Ramsey AJ, Fitzpatrick PF (Jun 1998). "Effects of phosphorylation of serine 40 of tyrosine hydroxylase on binding of catecholamines: evidence for a novel regulatory mechanism". Biochemistry. 37 (25): 8980–6. doi:10.1021/bi980582l. PMID 9636040. ^ Dewing P, Chiang CW, Sinchak K, Sim H, Fernagut PO, Kelly S, Chesselet MF, Micevych PE, Albrecht KH, Harley VR, Vilain E (Feb 2006). "Direct regulation of adult brain function by the male-specific factor SRY". Current Biology. 16 (4): 415–20. doi:10.1016/j.cub.2006.01.017. PMID 16488877. ^ a b Bobrovskaya L, Gilligan C, Bolster EK, Flaherty JJ, Dickson PW, Dunkley PR (Jan 2007). "Sustained phosphorylation of tyrosine hydroxylase at serine 40: a novel mechanism for maintenance of catecholamine synthesis". Journal of Neurochemistry. 100 (2): 479–89. doi:10.1111/j.1471-4159.2006.04213.x. PMID 17064352. ^ Thibaut F, Ribeyre JM, Dourmap N, Meloni R, Laurent C, Campion D, Ménard JF, Dollfus S, Mallet J, Petit M (Feb 1997). "Association of DNA polymorphism in the first intron of the tyrosine hydroxylase gene with disturbances of the catecholaminergic system in schizophrenia". Schizophrenia Research. 23 (3): 259–64. doi:10.1016/s0920-9964(96)00118-1. PMID 9075305. ^ Steinacker P, Aitken A, Otto M (Sep 2011). "14-3-3 proteins in neurodegeneration". Seminars in Cell & Developmental Biology. 22 (7): 696–704. doi:10.1016/j.semcdb.2011.08.005. PMID 21920445. ^ Sawada M, Hirata Y, Arai H, Iizuka R, Nagatsu T (Mar 1987). "Tyrosine hydroxylase, tryptophan hydroxylase, biopterin, and neopterin in the brains of normal controls and patients with senile dementia of Alzheimer type". Journal of Neurochemistry. 48 (3): 760–4. doi:10.1111/j.1471-4159.1987.tb05582.x. PMID 2879891. ^ Hedstrand H, Ekwall O, Haavik J, Landgren E, Betterle C, Perheentupa J, Gustafsson J, Husebye E, Rorsman F, Kämpe O (Jan 2000). "Identification of tyrosine hydroxylase as an autoantigen in autoimmune polyendocrine syndrome type I". Biochemical and Biophysical Research Communications. 267 (1): 456–61. doi:10.1006/bbrc.1999.1945. PMID 10623641. ^ Ono M, Okamoto M, Kawabe N, Umezawa H, Takeuchi T (Mar 1971). "Oudenone, a novel tyrosine hydroxylase inhibitor from microbial origin". Journal of the American Chemical Society. 93 (5): 1285–6. doi:10.1021/ja00734a054. PMID 5545929. ^ Ayukawa S, Takeuchi T, Sezaki M, Hara T, Umezawa H (May 1968). "Inhibition of tyrosine hydroxylase by aquayamycin". The Journal of Antibiotics. 21 (5): 350–3. doi:10.7164/antibiotics.21.350. PMID 5726288. Masserano JM, Weiner N (1983). "Tyrosine hydroxylase regulation in the central nervous system". Molecular and Cellular Biochemistry. 53-54 (1–2): 129–52. doi:10.1007/BF00225250. PMID 6137760. Meloni R, Biguet NF, Mallet J (2002). "Post-genomic era and gene discovery for psychiatric diseases: there is a new art of the trade? The example of the HUMTH01 microsatellite in the Tyrosine Hydroxylase gene". Molecular Neurobiology. 26 (2–3): 389–403. doi:10.1385/MN:26:2-3:389. PMID 12428766. Joh TH, Park DH, Reis DJ (Oct 1978). "Direct phosphorylation of brain tyrosine hydroxylase by cyclic AMP-dependent protein kinase: mechanism of enzyme activation". Proceedings of the National Academy of Sciences of the United States of America. 75 (10): 4744–8. doi:10.1073/pnas.75.10.4744. PMC 336196. PMID 33381. Haycock JW, Ahn NG, Cobb MH, Krebs EG (Mar 1992). "ERK1 and ERK2, two microtubule-associated protein 2 kinases, mediate the phosphorylation of tyrosine hydroxylase at serine-31 in situ". Proceedings of the National Academy of Sciences of the United States of America. 89 (6): 2365–9. doi:10.1073/pnas.89.6.2365. PMC 48658. PMID 1347949. Haycock JW (Jul 1990). "Phosphorylation of tyrosine hydroxylase in situ at serine 8, 19, 31, and 40". The Journal of Biological Chemistry. 265 (20): 11682–91. PMID 1973163. Craig SP, Buckle VJ, Lamouroux A, Mallet J, Craig I (1986). "Localization of the human tyrosine hydroxylase gene to 11p15: gene duplication and evolution of metabolic pathways". Cytogenetics and Cell Genetics. 42 (1–2): 29–32. doi:10.1159/000132246. PMID 2872999. Grima B, Lamouroux A, Boni C, Julien JF, Javoy-Agid F, Mallet J (1987). "A single human gene encoding multiple tyrosine hydroxylases with different predicted functional characteristics". Nature. 326 (6114): 707–11. doi:10.1038/326707a0. PMID 2882428. Kaneda N, Kobayashi K, Ichinose H, Kishi F, Nakazawa A, Kurosawa Y, Fujita K, Nagatsu T (Aug 1987). "Isolation of a novel cDNA clone for human tyrosine hydroxylase: alternative RNA splicing produces four kinds of mRNA from a single gene". Biochemical and Biophysical Research Communications. 146 (3): 971–5. doi:10.1016/0006-291X(87)90742-X. PMID 2887169. Kobayashi K, Kaneda N, Ichinose H, Kishi F, Nakazawa A, Kurosawa Y, Fujita K, Nagatsu T (Aug 1987). "Isolation of a full-length cDNA clone encoding human tyrosine hydroxylase type 3". Nucleic Acids Research. 15 (16): 6733. doi:10.1093/nar/15.16.6733. PMC 306135. PMID 2888085. O'Malley KL, Anhalt MJ, Martin BM, Kelsoe JR, Winfield SL, Ginns EI (Nov 1987). "Isolation and characterization of the human tyrosine hydroxylase gene: identification of 5' alternative splice sites responsible for multiple mRNAs". Biochemistry. 26 (22): 6910–4. doi:10.1021/bi00396a007. PMID 2892528. Le Bourdellès B, Boularand S, Boni C, Horellou P, Dumas S, Grima B, Mallet J (Mar 1988). "Analysis of the 5' region of the human tyrosine hydroxylase gene: combinatorial patterns of exon splicing generate multiple regulated tyrosine hydroxylase isoforms". Journal of Neurochemistry. 50 (3): 988–91. doi:10.1111/j.1471-4159.1988.tb03009.x. PMID 2892893. Ginns EI, Rehavi M, Martin BM, Weller M, O'Malley KL, LaMarca ME, McAllister CG, Paul SM (May 1988). "Expression of human tyrosine hydroxylase cDNA in invertebrate cells using a baculovirus vector". The Journal of Biological Chemistry. 263 (15): 7406–10. PMID 2896667. Kobayashi K, Kaneda N, Ichinose H, Kishi F, Nakazawa A, Kurosawa Y, Fujita K, Nagatsu T (Jun 1988). "Structure of the human tyrosine hydroxylase gene: alternative splicing from a single gene accounts for generation of four mRNA types". Journal of Biochemistry. 103 (6): 907–12. PMID 2902075. Coker GT, Vinnedge L, O'Malley KL (Dec 1988). "Characterization of rat and human tyrosine hydroxylase genes: functional expression of both promoters in neuronal and non-neuronal cell types". Biochemical and Biophysical Research Communications. 157 (3): 1341–7. doi:10.1016/S0006-291X(88)81022-2. PMID 2905129. Vulliet PR, Woodgett JR, Cohen P (Nov 1984). "Phosphorylation of tyrosine hydroxylase by calmodulin-dependent multiprotein kinase". The Journal of Biological Chemistry. 259 (22): 13680–3. PMID 6150037. Zhou QY, Quaife CJ, Palmiter RD (Apr 1995). "Targeted disruption of the tyrosine hydroxylase gene reveals that catecholamines are required for mouse fetal development". Nature. 374 (6523): 640–3. doi:10.1038/374640a0. PMID 7715703. Lüdecke B, Bartholomé K (Jun 1995). 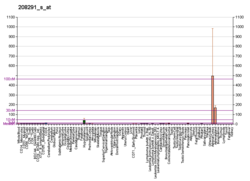 "Frequent sequence variant in the human tyrosine hydroxylase gene". Human Genetics. 95 (6): 716. doi:10.1007/BF00209496. PMID 7789962. Lüdecke B, Dworniczak B, Bartholomé K (Jan 1995). "A point mutation in the tyrosine hydroxylase gene associated with Segawa's syndrome". Human Genetics. 95 (1): 123–5. doi:10.1007/BF00225091. PMID 7814018. Knappskog PM, Flatmark T, Mallet J, Lüdecke B, Bartholomé K (Jul 1995). "Recessively inherited L-DOPA-responsive dystonia caused by a point mutation (Q381K) in the tyrosine hydroxylase gene". Human Molecular Genetics. 4 (7): 1209–12. doi:10.1093/hmg/4.7.1209. PMID 8528210. This page was last edited on 21 November 2018, at 06:55 (UTC).